Commercial Installations from C&J Stonemasonry. The leading worktop installer. 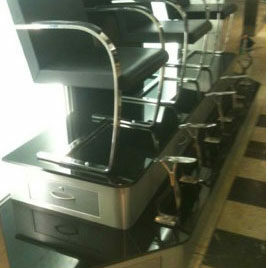 We love the challenge of installing our quartz and granite worktops in commercial properties. They often require more work due to the size and intricacies of the property. 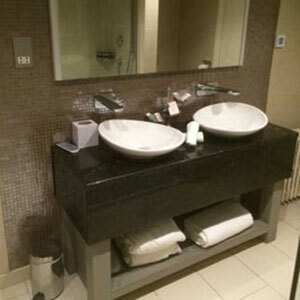 We have installed our stone work surfaces in a wide variety of commercial settings, including pubs, hotels, estate agents, ice-cream parlours, restaurants and even a shoe shine stand in London. We have worked on numerous new-builds with housing development companies. 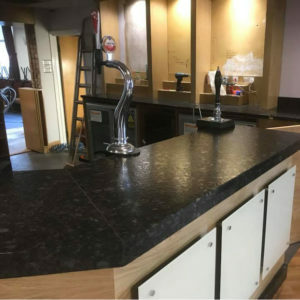 Our expertise and attention to detail make us one of the leading UK installers of granite and quartz worktops in commercial properties. We offer a flexible approach and are happy to work alongside other trades-people when completing installations. We always work to the highest standard, have outstanding Quality Control and offer a first-rate service to all our customers. We are happy to undertake projects of any size, from single installations to complete refurbishments of properties. We offer a bespoke tailored service, and our state of the art machinery and highly trained and qualified fitters ensure a perfect finish. 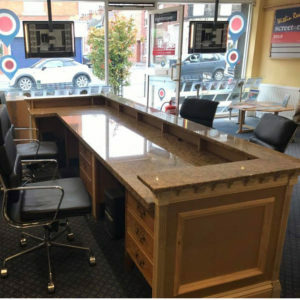 Giallo Veneziano Granite reception desk in an estate agent in Snaith.